Managerial communication is considered integral to business related disciplines such as strategic management, leadership, strategic marketing, and business ethics. 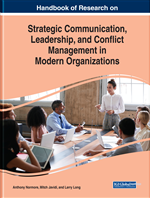 However, within the context of global strategic management, managerial communication follows under the broad umbrella of “business communication,” Communication with internal and external stakeholders demands careful-ethical considerations, regardless of the industry. Having an inclusive-ethical strategic managerial communication policy in place, allows for strategic information dissemination as well as the protection of transmission of confidential data. This chapter discusses the topic of communication with emphasis on ethical managerial communication within the global context. The result of the study confirm that effective-ethical communication strategies and appropriate communications policy implementation is conducive to the firm's success. Within the framework of management, ethical managerial communication refers to communication within the context of business management and not media communication. Within the context of communication, trying to persuade what is ethical and what is not may influence the management’s ability to communicate ethically and effectively. The “inability” communicative with full transparency within the company and with stakeholders outside the company may lead to complex problems. Consequently, managerial decisions must be taken which could lead to unintended consequences. For example, an expatriate managing a family owned enterprise may discover that a relative working in management is embezzling company money. Should the expatriate manager communicate the problem to the ownership? If so, how? Will they believe him/ her? Will they understand and support the expatriate, or will the owners retaliate again him/her? If there is no clear communication policy in place, the expatriate will have to make a tough decision: a) say nothing; b) communicate the discovery in an ethical manner to the ownership; c) contact the embezzler first and explain and inform him/her about the responsibility to inform the owners; or d) consult a legal counsel first. Obviously, there are no easy answers unless an inclusive - strategic communication plan has been implemented for all stakeholders, regardless of the role or responsibility. The current global business environment is characterized by an explosion in information technology, globalization of the economies, localized - acute ecopolitical crisis, and increased pressure from consumers, organized labor, and government regulations/ deregulations. It is clear that communicating freely and ethically becomes challenging. As a result, managers often chose “silence” over communication, in the hope that bad things will just go away, instead problems only escalate the majority of times. Ethical managers can create a certain image (positive or negative) of the organization, both within the company, and in the community and society. Therefore, considering that global corporations are becoming bigger and more powerful, there is a need for managers to communicate in an ethical and socially responsible manner. Over the last decade, there has been an overwhelming interest by scholars on the importance of socially responsible communication. Social scientists are dynamically engaging in the much-discussed topic of “micro aggression in managerial communication” and ethics in communication (Makau, 2009; Sue, 2010). In a broad sense, Managerial Communication today is an integral component of many business-related disciplines (strategic management, leadership, strategic marketing, international negotiation, business ethics, etc.). Cross-cultural communication, however, encompasses every area of communication including interpersonal communication (Lustig & Koester, 2010). This topic is usually integrated in courses under the discipline of Media Communication, which does not fall within the scope of this research. A global search on the topic of cross-cultural communication within the global business context reveals that the discipline is under-researched. In fact, since 2010, UNESCO (United Nations Education Scientific and Cultural Organization) has been running a multilingual program called Transcultural Communication in the Digital Age (UNESCO, 2010). Its scope is to strengthen research in the field of multilingual and transcultural communication, including multilingual computing methods, e-learning, multilingual web content management, and related methods; to promote the development of a multilingual social web, harnessing semantic web technologies and strengthening transcultural communication patterns using a wide range of language resources and technologies; and multilingual computing methods, multilingual e-learning and cultural diversity management procedures (UNESCO). Electronic Communication: Communication by advanced technologies. Ethics: The study of values, of what is more or less important, of the “good,” of behavioral guidelines and norms. Ethics provides frameworks and tools for recognizing and assessing available options and for differentiating between more or less morally justified pathways in any given situation. Ethics is a choice. An individual or group has options available in any given situation while being morally responsible. Information Technology: A term that encompasses all forms of technology used to create, store, exchange, and use information in its various forms (business data, voice conversations, still images, motion pictures, multimedia presentations, and other forms, including those not yet conceived). It's a convenient term for including both telephony and computer technology in the same word. Communication Policy: Strategic information dissemination and a protection of transmission of confidential data. Managerial Communication: Decisive means by which the manager fulfils his/her tasks and duties, and employs the competences and skills pertaining to his/her role in the company and in relation to business partners. The manager sends information to the members of an organization and its business partners, and their response influences his/her subsequent decisions and behavior. Communication Plan: The art and science of reaching target audiences using marketing communication channels such as advertising, public relations, experiences, or direct mail, for example. It is concerned with deciding who to target, when, with what message, and how. The communication plan serves as a guide to the communication efforts throughout the duration of the project. It is a living and working document, and is updated periodically as audience needs change. Communication: The use of available resources to convey information, to move, to inspire, to persuade, to enlighten, to connect is an inherently ethical undertaking. Regardless of context, communication involves choice, reflects values, and has consequences. These three key elements of communication form the basis of its ethical makeup.